Many first time cruisers have concerns about what a Royal Caribbean cruise is all about, and what it entails. There is certainly a fair amount of pre-trip planning that can be beneficial to improving a trip, but there are also a few aspects of cruise planning that one should not concern themselves with prior to sailing. Here are five parts of any Royal Caribbean cruise that you should not worry about before getting onboard. If there is one thing many first time cruisers ask a lot of questions about it, it is about getting sea sick. Let us be clear, going on a Royal Caribbean cruise is nothing like going out on your buddy's fishing boat. 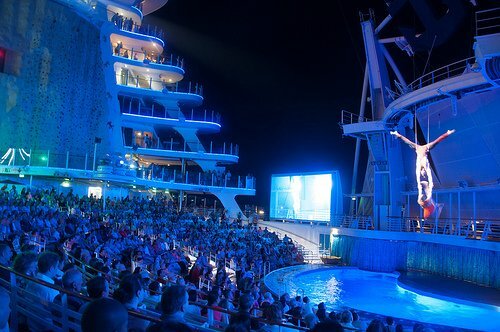 Royal Caribbean ships are massive vessels, equipped with precise GPS and stablizing technology. Moreover, the Captain will regularly plot courses that take optimal routes for guest comfort. There are certain steps you can take to mitigate the risk of getting sea sick, such as over the counter medications and homeopathic treatments. The bottom line is while one could get sea sick on a cruise, it is a very low risk. In fact, if you ask veteran cruisers, they will likely tell you their concern over getting sea sick is ranked somewhere around the feature film selection shown onboard. Hurricane season in the Atlantic runs between June 1 - November 30, and poses a significant threat each year to people all around North America. Despite the ferocity of hurricanes, a Royal Caribbean cruise is a very safe vacation choice, even if there is a possible hurricane. First and foremost, Royal Caribbean sends its ships well out of the path of known storms. 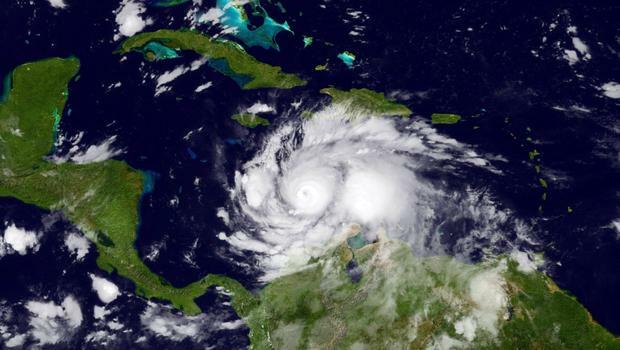 While hurricane forecasting is not always precise, once a storm forms, it will affect a certain region of the Caribbean or Atlantic, and Royal Caribbean makes proper plans to alternate itineraries when necessary to steer clear of these storms. The cruise line wants its guests and crew to remain safe, its equipment out of harms way, and maintain a high level of guest satisfaction. So changing from an Eastern to a Western itinerary or dropping a scheduled port stop is an easy to achieve that. First time cruisers should also be aware that bad weather can happen throughout the year, and storms occur outside of hurricane season too. In addition, no one can control the weather or with any definitive knowledge tell you any sailing will be free of weather concerns. Your best bet is to book a sailing that works for you, and have trust in the cruise line and the ship's crew to provide an excellent vacation experience, rain or shine. In years past, one responsibility of guests were to hand out gratuities to crew members onboard. Not only was this time consuming, it was awkward. These days, Royal Caribbean has simplified the whole process with automatic gratuities. Each day of your cruise, guests are charged an automatic gratuity that goes towards their dining room staff and stateroom attendant. Onboard purchases at bars, restaurants and lounges also include an automatic gratuity to simplify things as well. Guests have the option of pre-paying their gratuities before the cruise to help break up the cost of the cruise. All of this means guests can focus on enjoying their vacation, rather than having to be concerned with who gets what tip and for how much. When someone who loves going on a cruise tries to encourage a friend or colleague to try a cruise, all too often they will hear a response of, "I'm worried there won't be enough to do," or even worse, "I think I would be bored." These sort of statements will likely give a cruise fan a good chuckle, because they know a Royal Caribbean cruise is anything but mundane or boring. In short, there is so much happening onboard that the most likely result will there being too much to do, rather than not enough. Royal Caribbean designs its cruise ships to be a destination, with lots of activities, dining, shows and more. Between the ports your ship will visit and the seemingly non-stop options listed in the ship's Cruise Compass, there is plenty to choose from. Of course, all the activities and events onboard are optional, which means you can do as much or as little as you like. Most guests prefer to sprinkle in activities alongside old fashioned relaxing. There is so much food available throughout the day and night on a Royal Caribbean cruise that being concerned with there not being enough to eat is one less thing to worry about. 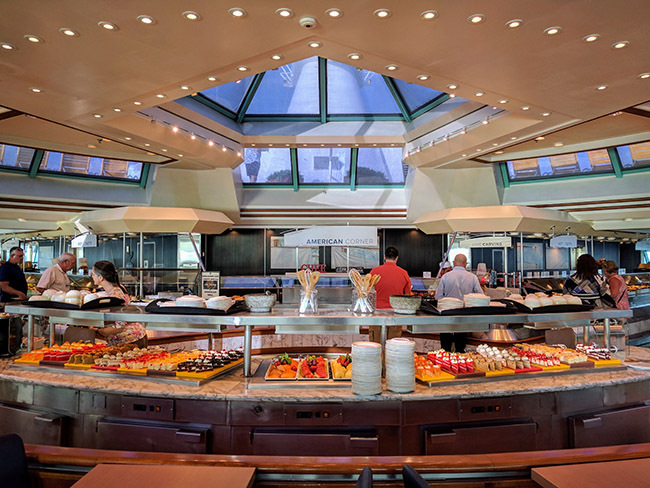 On a Royal Caribbean ship, guests will find a lot of food included in their cruise fare, along with specialty dining options that augment the standard fare. Complimentary food is available for all meals, and time inbetween. Simply put, there is plenty of great food included in the cost of your Royal Caribbean cruise. One can easily go an entire food and enjoy nothing but food that has no additional cost from morning to night. After all, that is what the concept of a cruise has been for a long time.